The Nokia C7, known internally as the “Tiger” isn’t likely to win over the hearts and minds of Android fans but we’re hoping it’s an early indicator that Nokia remains committed to T-Mobile. Of course, Nokia has also committed to WIndows Phone 7 but in the meantime, the C7 is on the way, 8 megapixel camera and all. 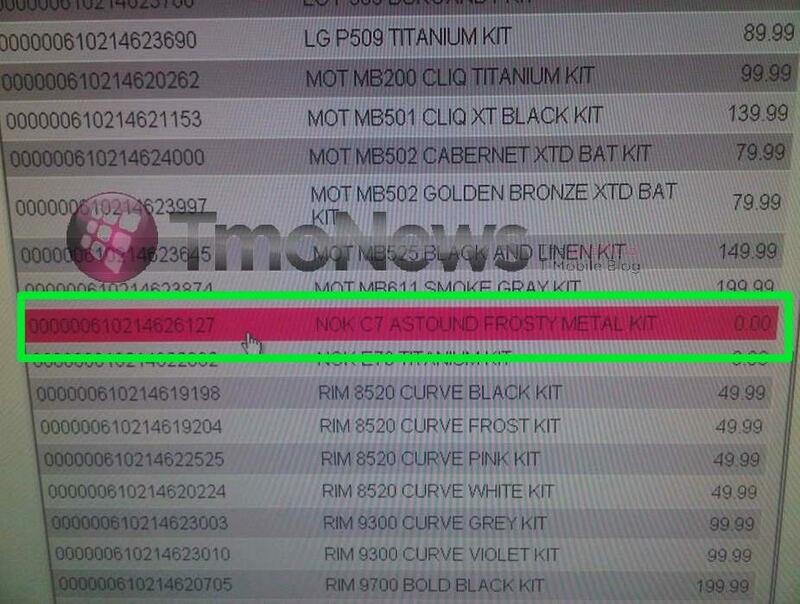 As you can see in the shot above, the C7 is already listed in T-Mobile’s inventory system in a “Frosty Metal” variety. Perhaps it’ll also come in a “Sunny Alloy” version as well. You don’t have to laugh at that. is that another nokia phone below it also? a nice beautiful phone, very classy!! phonedog has renders of HTC pyramid. Haha this is ashame. Like really???? Wow T-Mobile is falling off like crazy what’s going on guys??? Smh and besides the only people who would buy this phone is old senior citizens or people who’s not really into smartphones like that and just want something to simple to make and receive calls lol this is a joke. While all the other carriers shows off big high range phones all it shows here is baby type phones that’s better off should be free for people on welfare lol I could keep going on how much I’m hating T-Mobile these days, I’m about to leave them real soon ugh! Other carriers carry non-smartphones too. Not everybody wants a smartphone. Sure… everybody that views this site might, but not everybody who is in the market for a phone. T-Mobile has plenty of high end devices, and more on the way. Here now: Galaxy 4G, G2, MyTouch 4G. Coming Soon: LG G2X (Optimus 2X), Sidekick 4G, LG G-Slate, and a dozen and a half other 4G devices by the end of the year. Your post is written in a way that implies that T-Mobile is hyping this phone. That isn’t the case though. Its just a phone that David & Co. are letting us know about on a blog, which is their job. T-Mobile hasn’t announced this, or hinted at it, or teased us on their twitter account like they have in the past for big launches. They have quietly added it to their line-up, and moved on. Every carrier has phones that aren’t going to ‘wow’ the tech crowd… and these devices are critical to their success. While smartphone customers are certainly a growing segment, and are an increasing priority due to the higher Revenue/Subscriber, they are still a very small segment compared to the masses of regular phone types. Exactly this phone isn’t for everyone or expected to be the next great thing. In the past nokia phones have had better reception than samsung, sharp and others. This phone might be an option for people living on the edge of coverage who don’t care for or need the latest greatest smart phone. It might be awhile for nokia and windows to come out with a phone that knocks your socks off, but I am looking forward to what they will bring us in the future. I am not sure why so-called “power users” on this site call Symbian phones “Not a smartphones”. Surely they are. There is Internet/email. There are a bunch of _native_ applications you can install on a Symbian phone. Symbian has it’s own version of Python! The latest crop of phones has a world-wide maps/GPS with turn-by-turn directions included for free which does not require constant connection to the Internet. So how is Android/Blackberry/iPhone is a smartphone and Nokia is not? Symbian(^3) is more of a smartphone than any Android or the iPhone! It’s the original, first smartphone OS, which at the beginning had like >90 % of the market. The N8 (from which this was sent from, and which has only a few features the C7 doesn’t have) can do way more than an iPhone (and costs less)! Okay, I accidentally “liked” your post instead of replying. Oops. You are rude, and make unnecessary comments about poor people. Plus your spelling an grammar are terrible. Anyway, I’ve got an N8, which is very similar to the C7. The differences are the HDMI port, and an awesome 12MPIX camera instead of the 8 on the C7. In return the C7 is slimmer and has a better screen. – Have world-wide GPS with pre-downloaded maps. When I went to Brazil for work, I downloaded the maps for the entire country into my phone before I left. Okay, in some ways this phone lags behind, but in other ways it is ahead of the pack. Add in the metal finish, and it should be an awesome phone. If I were to buy a locked T-Mobile phone, this would be it. I can’t wait! At the top of my phone wish list is Windows 7 (I have a Zune pass and what a way to make the most of it) and a camera that can meet or beat my Samsung Memoir (8mp zeon flash). I mean serioulsy who wants to carry around an MP3 player, a phone and a digital camera… when you can have one device of good quality that can be all three… my purse it heavy enough :-) About time Tmo!!! can’t wait! Yeah, it’s like Symbian^3. You must’ve missed out on a few blog post. This phone is going to be called the Astound. T-Mobile employees received a training on it. why would anyone buy any windows phone. give me a break windows phones are pure crap. Plain and simply pure crap. You’ve obviously never used wp7. I have this device, and it is a extremely good mid range device. Its free global offline navigation is priceless, and the audio & video are great as well. One thing I dont like is text entry, but that is sorted in PR 2.0 which is installed in this device. Well done TMO. What, in your opinion, keeps it from being high end? It has a powerful GPU that powers the same games as Android and iOS with the same graphics, has great build quality and components (microphone), amazing gorilla glass screen, Bluetooth 3.0, TV-out and a lot of other T-Mobile additions such as wifi-calling. It supports more video and audio codecs than any other T-Mobile phone, records better video and sound better, plays back media better, the screen has better visibility and the Navigation works when all other T-Mobile phones (except the other 2 Nokias) won’t. Serious question. What makes it a mid range device in your opinion? It appears that most people just won’t give credit where it is due. This device is as high end as it gets when it comes to phones with 8Mpix. If you are talking CPU speed, people need to realize that it is NOT the CPU that powers their fancy 3D apps and smash gaming benchmarks but it is the GPU. The GPU is in the same class and even better than most GPUs in every T-Mobile phone released. If you are talking about UI keeping it from being highend: That is a personal taste/opinion and the phone is still highend based on hardware capability. It is the same way that low-end is based on hardware capability. The Huwaie Ideos is a low-end Android phone, not because it is Android, but because it does not include a GPU and therefore cannot play the same games as the Vibrant, G2 or other highend GPU accellerated phones. On the same token, the C7 is a highend phone becuase it has a leading GPU that enables the same graphical performance as the highend iOS, Android and WP7 devices that we either love or hate. I know I typed a lot, but I am really curios because a lot of people rather put Nokia down and if they don’t put them down blatantly, they still try to keep them below competitors. Fact is, the phone is powerful, high end and full of smartphone features. If you are talking camera, 8mp does not make it mid-range because that is not only a higher mp that almost all of T-Mobiles phones (Memior) but also a better sensor and lense and video quality. And then we can’t compare it to the N8 and say that the N8 is highend and this isn’t. If we do that then all of T-mobiles phones become low to midrange because none can match the N8s 12mp, glass Zeiss Xenon snapper, if you base it off camera. The reason I am asking is that you are a very sensible poster and I haven’t seen you spout out silly comments or act like a rabid fanboy so I would like to know another perspective. Maybe I am not understanding the midrange assessment and I believe it is always better to ask than to assume. FYI for any Americans reading this – Symbian (which this phone runs the very latest version of) was the 1st smartphone OS in the world, and is the leading smartphone OS by a LOOOONG way (in the world, not the US). It is considerably more advanced than the iPhone or Android OSes which are still playing catchup to Symbian’s features, power and simplicity (and even farther in advance of Windows Phone which is just rubbish apart from the UI). This is just simple fact. Do not believe the biased American media that thinks iPhone and Android are the only things going. A great many people the world over (including Americans!) have converted from using Android and iPhone to using Nokia Symbian, it’s a breath of fresh air to many people for it’s power and simplicity. The build quality on Nokias is also legendary, again far in advance of rivals at taking all sorts of physical punishment, AND Nokias come top for signal strength and battery life, again far in advance of rivals. Nokia’s Ovi app store also now has 20,000 apps and lots of the best ones from other platforms, and is the 2nd best performing app store on the planet. I’d say give this phone a shot, it’ll surprise you.